Willow Shields has given an exclusive interview with Socialite Life. 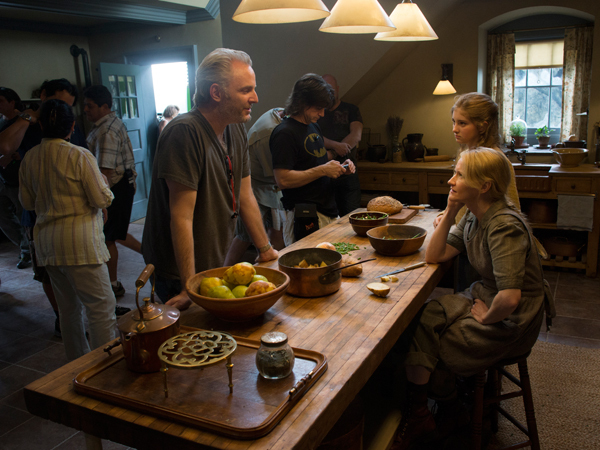 She discusses her work on Catching Fire, the evolution of Prim, and her relationship with Jennifer Lawrence. What is your favorite thing about Prim’s evolution? My favorite thing is just how mature she’s getting, and how much she’s kind of there for Katniss now. I think it’s a great evolution from starting as such a young girl who has gone through so much in her life to coming out with strength instead of sadness. What is your favorite thing about Katniss and Prim’s relationship? My favorite thing is that we really realize that bond from the beginning. The whole reason Katniss goes into The Hunger Games is to save her sister. I think it’s such a strong bond from the beginning and travels on throughout the whole series. There’s a sort of role reversal where Prim is really there for Katniss, but they always have that strong bond throughout the whole series. Besides the trailer scene, what was your favorite scene to watch? I really loved seeing all the scenes in the arena because I’m filming scenes in District 12. But when they to all the scenes in the arena I haven’t really seen any glimpses of what’s going on in the arena, or what they’re filming for the arena scenes. I’m like a fan going to see the movie because I almost don’t know what to expect in the arena scenes. Were there any pranks in between scenes? Not really. There was a lot of goofing off. In one scene – it’s a pretty serious scene and I have that cat with me in Catching Fire. She [Jennifer] is in the corner with cat toys trying to get me to laugh. You know, Jenn has set out to make people laugh in scenes when she’s not on camera. That can make it very challenging. She’s definitely taught me a lot. Has Jennifer Lawrence given you any advice? She’s given me advice about being who I am about being who I am and not changing because of Hollywood. That’s good advice and I’m definitely going to remember that. She hasn’t changed at all and that’s great. She’s such a fun person to work with. Why should fans go get the DVD immediately after its release? It would be really fun because you get an up close feel about what it’s like on set. A really fun behind-the-scenes and deleted scenes. For fans it’s a great experience because they get to witness what goes on on set and how we make a movie. Read the full article over at Socialite Life.